This is a blog about spiders. This is a blog about spiders! Mimetidae are the pirates of the spider world, but their acts of theivery take place on the webs, rather than ships, of other spiders. 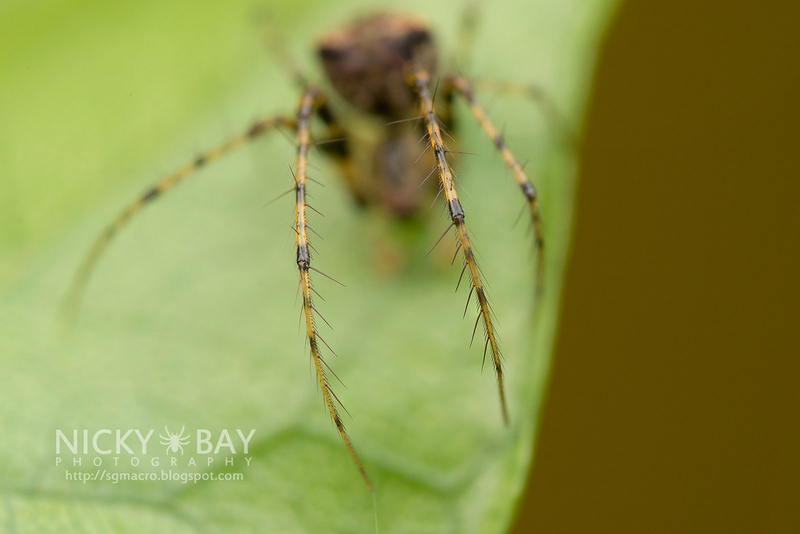 The name Mimetidae means “imitator” and is thus a very fitting name for these sneaky spiders. A mimetid found at Payne’s Prairie in Florida. Photo: Sean McCann (used with permission). Common names for this family include pirate spiders and cannibal spiders, for reasons that will soon become clear. They have a worldwide distribution, occurring on every continent except Antarctica, and everywhere in North America except the arctic. What makes mimetids so fascinating is their predatory behaviour. These spiders don’t build their own webs. 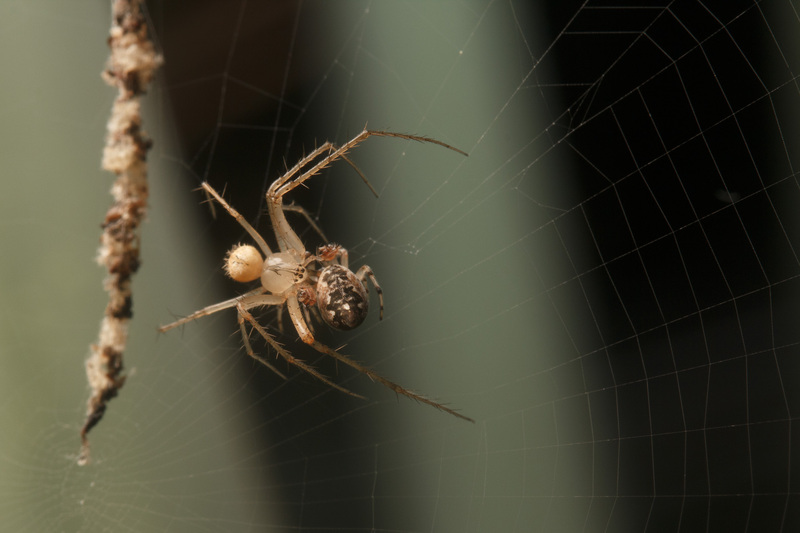 Instead, they invade the webs of other spiders – most often spiders in the families Araneidae (orb-weavers), Theridiidae (cobweb weavers), and Dictynidae (mesh web weavers). Here’s a series of photographs showing an interaction between a pirate spider and an orb-weaver in Arizona. (Full disclosure: Sean and I introduced the mimetid ourselves, hoping to witness a predation event). 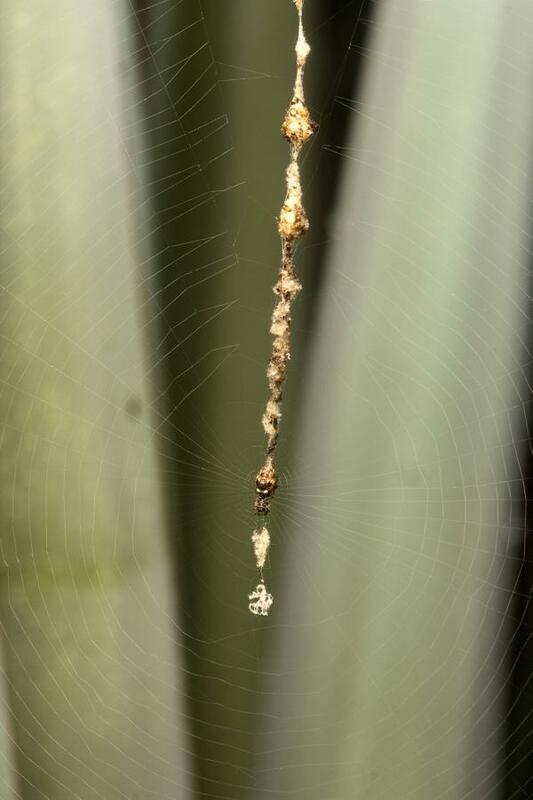 Below is the web of a trashline orbweaver, Cyclosa turbinata (family Araneidae). 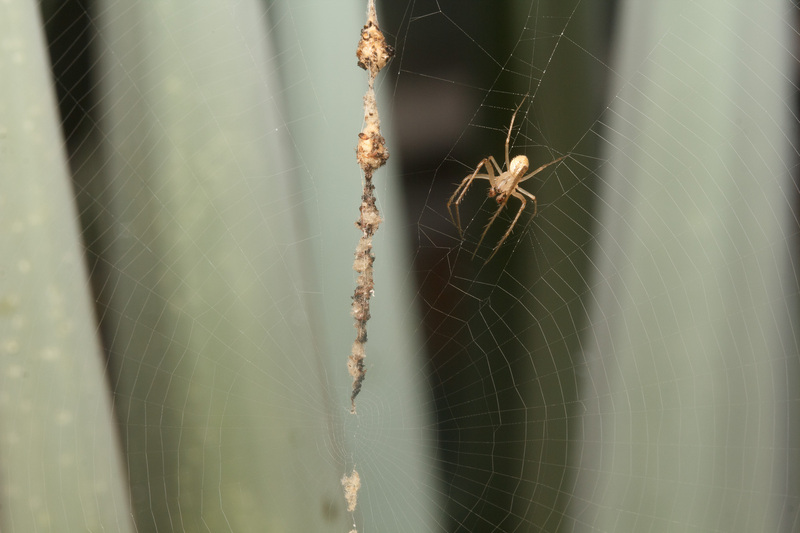 The vertical “trashline” that bisects the upper half of the orb is made of old prey carcasses. This photo and the rest in this series by Sean McCann. Here’s a closer look at the trashline. The spider is well camouflaged when she sits right in the centre of the orb-web. Here’s a better view of the spider herself. And this is another Cyclosa conica female, for a better idea of what these spiders look like. Ok, now back to the pirate spider! 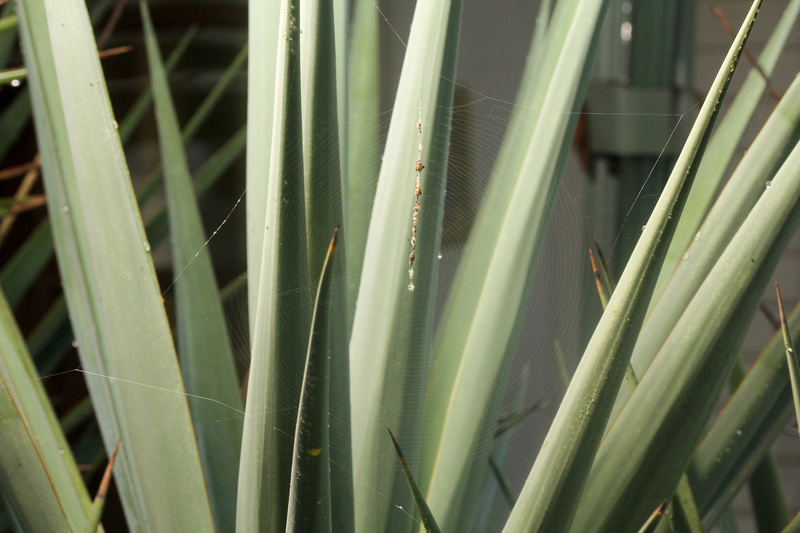 This is a male Mimetus hesperus that we found nearby, and introduced onto the yucca right next to the orb-web. Soon he entered the periphery of the web and assumed the ‘legs cocked’ posture characteristic of hunting mimetids. 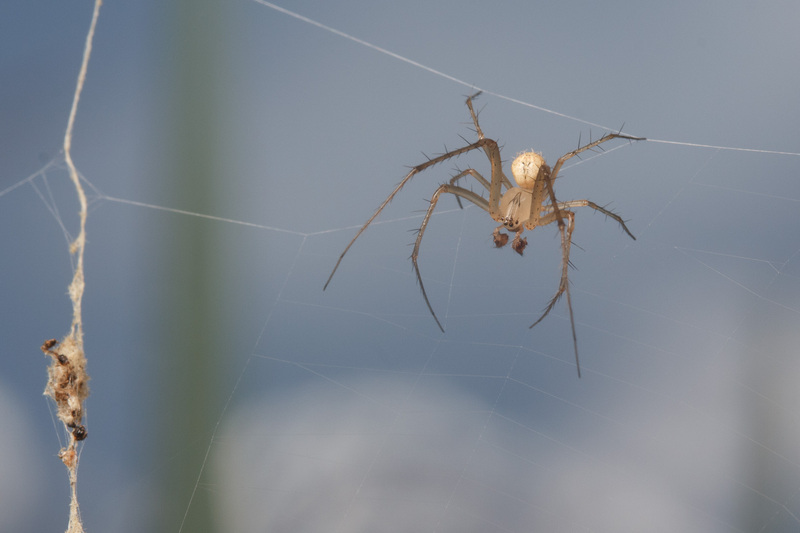 He then started carefully plucking the threads of the orb-web with his front pair of legs. 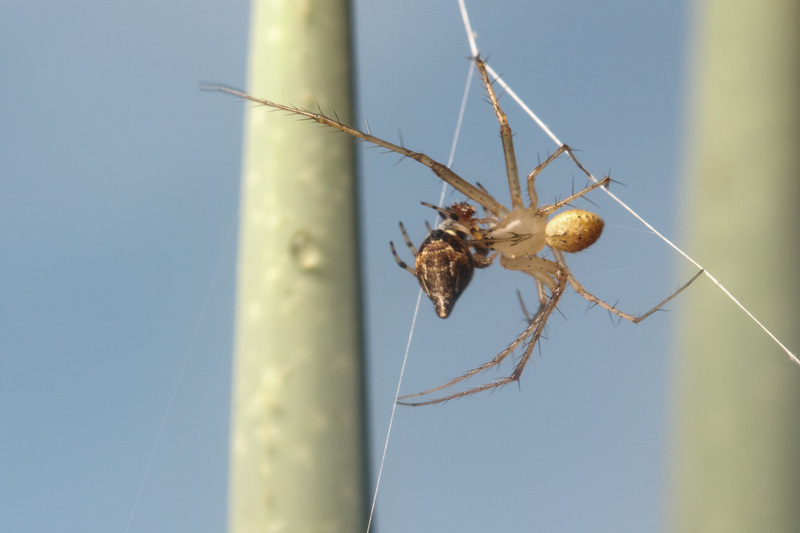 This plucking makes the web vibrate in very much the same way it would if an insect had been captured, and resulted in the Cyclosa female orienting toward the source of the vibrations, but remaining in the hub of the web. 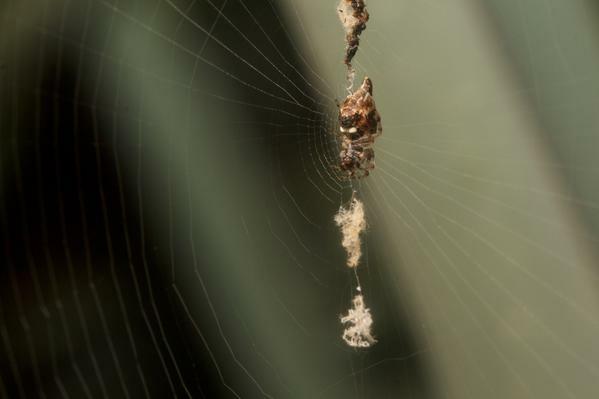 Gradually Mimetus began to move toward the hub of the orb-web, plucking and sometimes even snapping spiral threads (much as would happen if a winged insect was struggling to free itself from the sticky threads). At first it seemed the mimetid was going to be successful in luring the female Cyclosa out onto the web and into its deadly embrace, but after a few steps toward the mimetid she suddenly dropped out of the web on a dragline. As soon as she started moving back toward the hub, Mimetus lunged and bit Cyclosa. Mimetids are equipped with a spider-specific venom that paralyzes their prey almost instantly. The successful pirate then carried its meal back to the periphery of the web to feed. Below you can see that he has Cyclosa by the leg. Apparently mimetids almost always bite the legs of their victims, and when they do paralysis occurs within moments. If they bite another spider’s abdomen, however, the venom takes much longer to work. We left the pirate enjoying his meal on the yucca. He may have gone on to find a new web to invade, or taken over Cyclosa’s web for a while. If we hadn’t interfered, he may have remained in the hub of the web and used it to capture insect prey himself. In addition to this sort of takeover, mimetids are also known to steal prey from the webs of other spiders who are much larger (and thus too big to prey on). They also sometimes eat the eggs of other spiders. Mimetus sp. from High Park in Toronto, Ontario. Photo: Sean McCann (used with permission). 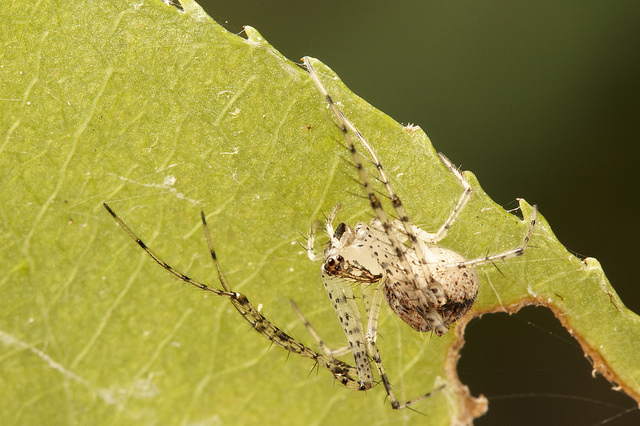 Mimetids look most similar to orb-weavers (araneids) and cobweb weavers (theridiids) but they can be distinguished from spiders in all other families by the unique pattern of spines on their first two pairs of very long legs. Nice example of the characteristic spination on the tibiae and tarsi (first two leg segments) of the first two legs of pirate spiders. Photo: Nicky Bay (used with permission). Check out more of Nicky’s awesome pirate spider photos here. 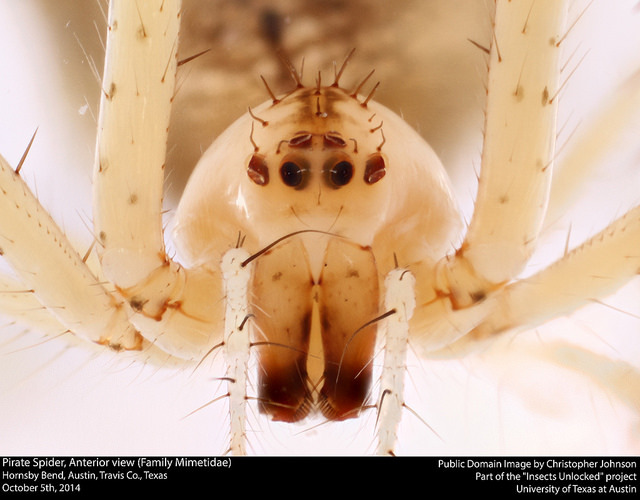 The eye arrangement is not so diagnostic (it’s quite similar to that of araneids and theridiids) but here’s a great portrait courtesy of the Insects Unlocked project. Finally, Mimetids build characteristic egg sacs that are easy to identify to genus even in the absence of the mother (who inevitably abandons her offspring). 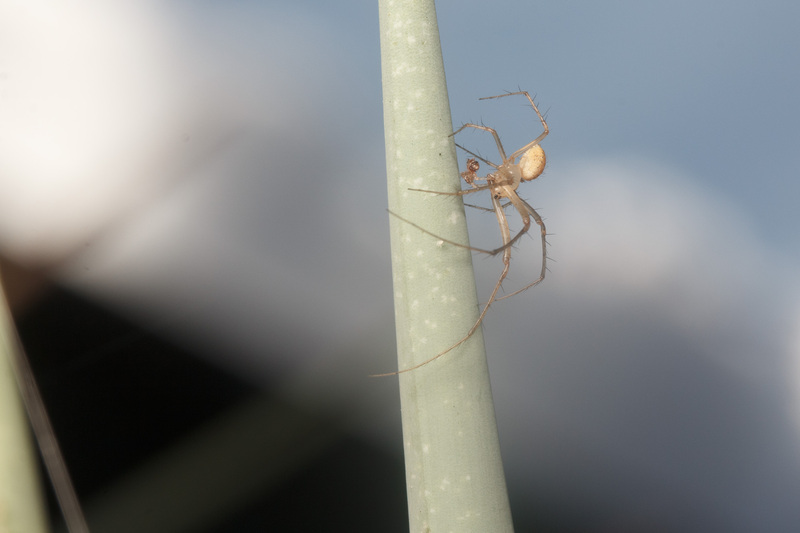 The sac has a long thin stalk and/or a fluffy coating, depending on the genus, and these two features may help protect the eggs within from parasitoids or predators. 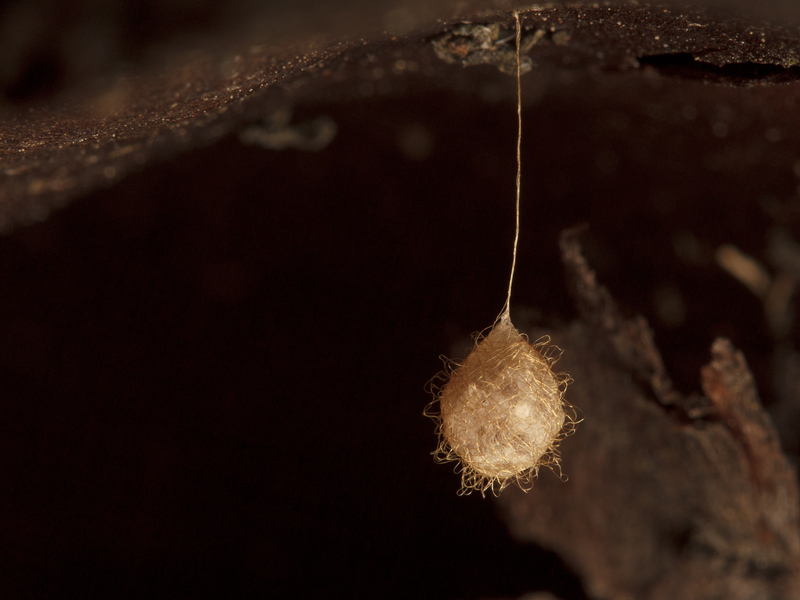 Egg sac of a mimetid in the genus Ero, found hanging inside a hollow stump in Burns Bog, Delta, BC. Photo: Sean McCann (used with permission). 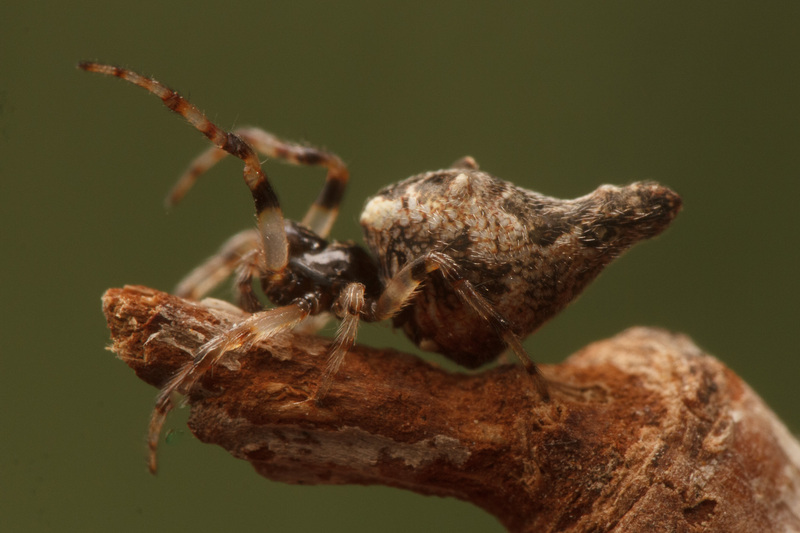 Eric Eaton’s blog post on pirate spiders. Africa Gomez’s blog post on pirate spiders. Bristowe, W. S. (1958). The world of spiders. London: Collins. Jackson, R. R., & Whitehouse, M. E. (1986). The biology of New Zealand and Queensland pirate spiders (Araneae, Mimetidae): aggressive mimicry, araneophagy and prey specialization. Journal of Zoology, 210(2), 279-303. Kloock, C. T. (2001). 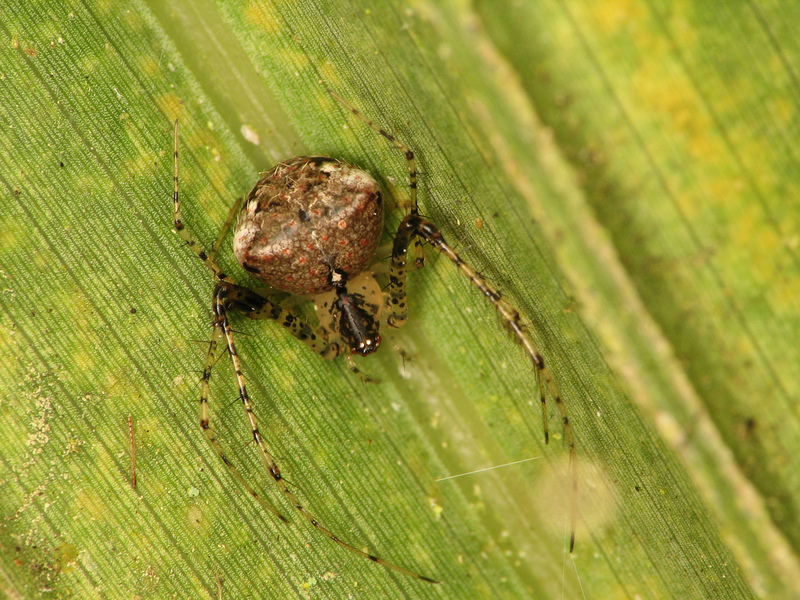 Diet and insectivory in the “araneophagic” spider, Mimetus notius (Araneae: Mimetidae). The American Midland Naturalist, 146(2), 424-428. Kloock, C. T. (2012). Natural History of the Pirate Spider Mimetus hesperus (Araneae; Mimetidae) in Kern County, California. The Southwestern Naturalist,57(4), 417-420. Science Borealis: vote for your favourite Canadian science blog! Announcing a new project: Recluse or Not?